This old English rhyme still holds meaning today. The Knot.com describes the meaning behind the poem using words like continuity, tradition, good luck, and optimism. 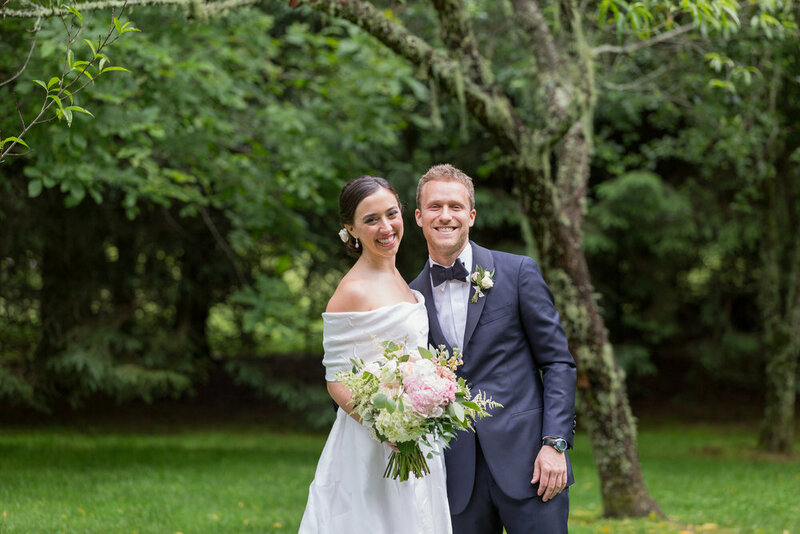 Martha and James’ April wedding embodied these words in spirit, and in all the details. From their invitations, to the wedding favors, the bride took classic designs, and gave them a fresh new look-- a traditional layout and font combination in an unexpected horizontal orientation. 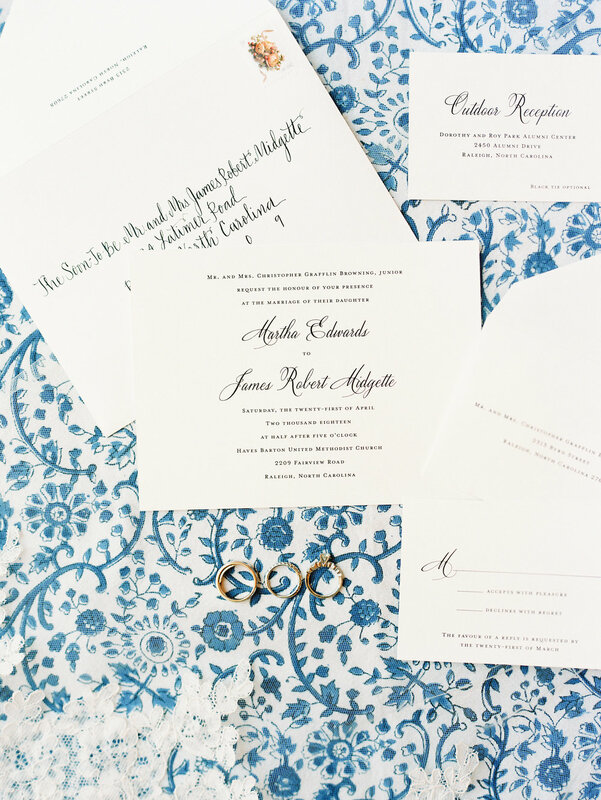 A time-honored marriage ceremony laid out in a petite, accordion fold wedding program. And the color blue, often used to symbolize love, purity, and fidelity, was sprinkled throughout the wedding reception. A new custom-designed duogram for the bride and groom was used on the Save the Dates. That same motif was carried into other pieces at the wedding (the program, napkins, and koozies). Martha used her program to not only lay out the order of the ceremony, but to describe her something old, something new. Every guest was treated to the sentiment behind many of the details. 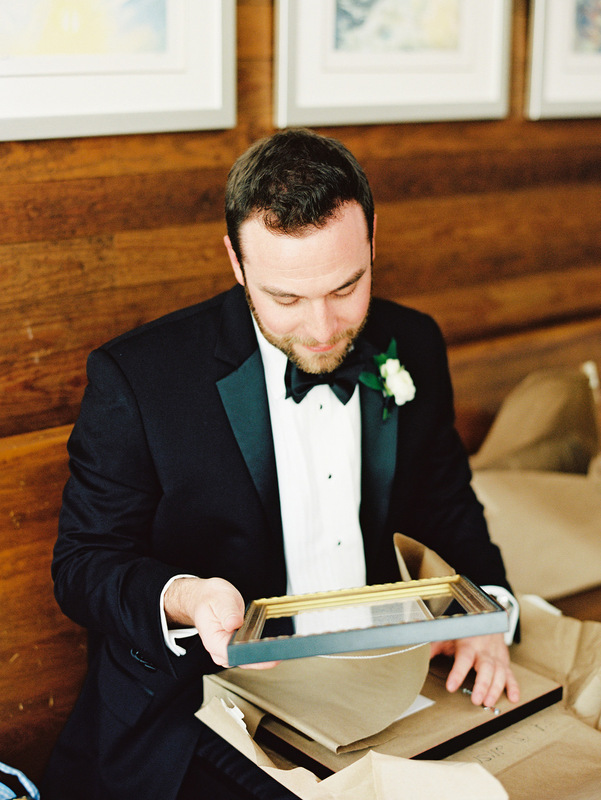 Fans of the handwritten note, we love how the bride and groom wrote letters to one another. Martha had some of her letters to James framed. 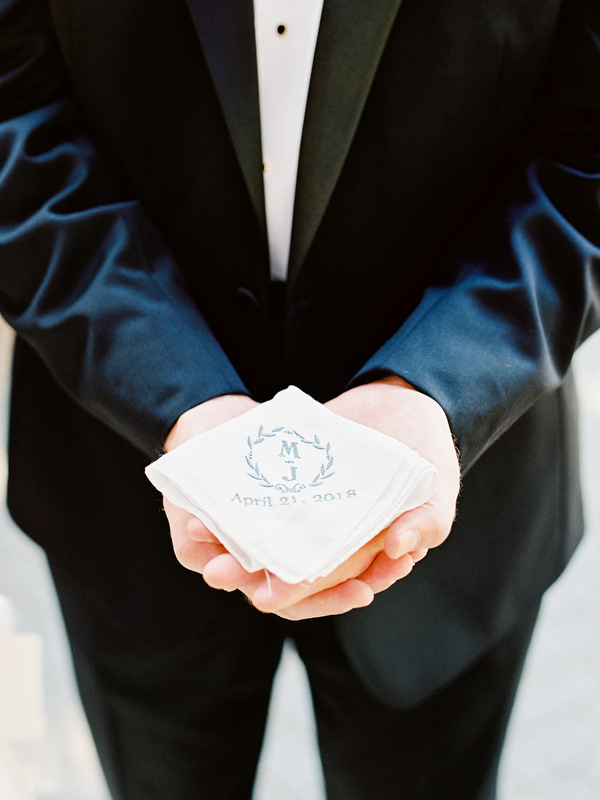 In another sweet gesture, James had their wedding motif embroidered on a handkerchief. Known to shed happy tears, it was the perfect present for Martha. And you can imagine that same handkerchief becoming a something old or something borrowed for a loved one in the future. Napkins and coasters are more than just a place to put your drink. Sure, they are practical. But like all details at the wedding, they can add to the festivities by reflecting your personality. What could be an overlooked square piece of paper, can be an invitation for your guests to let loose and have fun! Many of our brides include their wedding hashtag on their napkins. Others like to carry the motif from programs or menus. It is a great way to pull together a cohesive look without being to theme-y. Cocktails napkins are a great place to use your married monogram or to introduce the new Mr. and Mrs.
Personalized cocktail napkins and koozies are often used at the bar or during the cocktail hour. If your cake will be passed and served to your guests, ask the servers to pass out a napkin with each piece, or arrange a set for the cake table. Don’t forget the powder room- adding personalized guest towels is a nice touch to remind your guests that you thought of everything! And you can't forget about engagement parties and the rehearsal dinner. 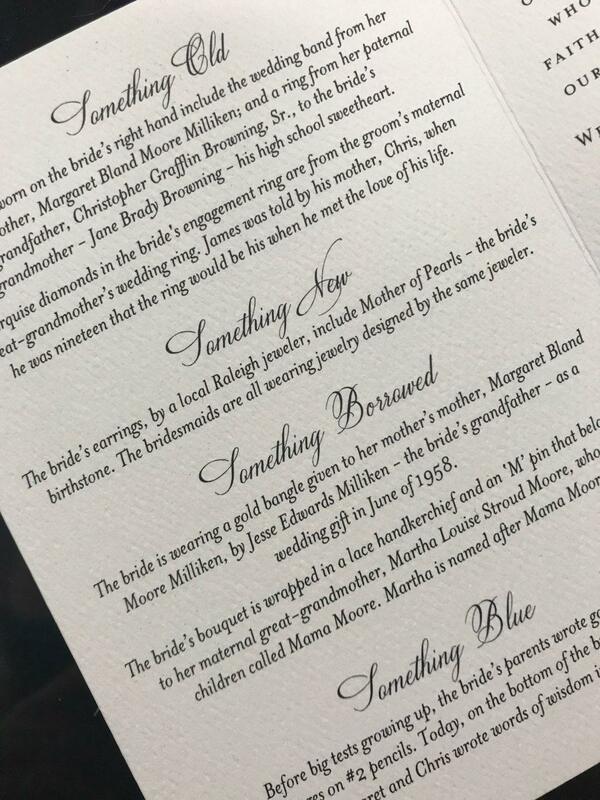 Each event can have its own personality (and therefore its own unique design) or you can order in bulk to use throughout the wedding weekend. We suggest a minimum of 3-4 napkins per person for the wedding day. That number can be adjusted if your venue will be supplementing with their own stock. Any leftovers can be used afterwards. Set them up on your bar or coffee table. Those personal touches will make your first house a home!